Get ready with cyclists from around the world and feel the spirit, passion and 100-year history of the Giro d'Italia in Beverly Hills on November 3 and Miami - Coral Gables on November 10. If you'll ride in Beverly Hills on November 3, or in Miami - Coral Gables on November 10, you'll have a chance to win free 1 week hotel stays in Italy with Italy Cycling Holidays. Wednesday, Oct 30, 11:59pm (today) online registrations closes for the west coast event on November 3 in BEVERLY HILLS. Wednesday, November 6, 11:59pm online registration closes for the east coast event on November 10 in MIAMI CORAL GABLES. Italian pro rider Pippo Pozzato will be the special guest rider. Registration and other details at www.granfondogiroditalia.com. Earlier this year came news that Viner had closed its doors, a company that began in 1947. "We are currently in the production phase of a limited edition, replica of our vintage steel beauty, "Record". Hand made in Italy, with custom drawn Columbus tubing, and beautiful, precision made lugs, and accessories from Richard Sachs." In the Tullio article I asked readers to contact me if they had more information. The Tullio article said, "After writing about Columbus, Falck, Oria, and Castello Mario & Figlio of Torino, we move onto one Italian tube set manufactuerer I had not previously heard of: "Tullio" from Padova. I don't have any details other than these photos which show a Tullio decal on a Maino and a page from an Atala catalog showing its use in the Corsa GS model. 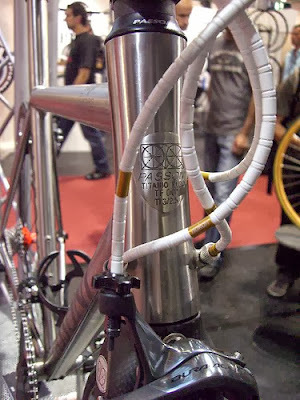 One source said, "Tullio tubing was an Italian straight-gauge, Hi Tensile tubing used on low to mid range Italian bikes made by Atala, Basso, etc.". One more thing on Atala tubing: "CRP" stands for "Cesare Rizzato Padova". 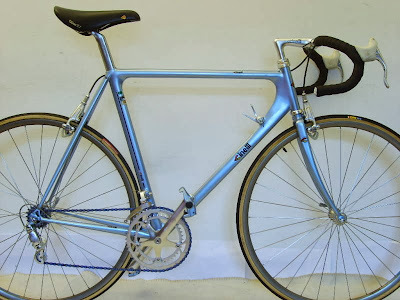 Cesare Rizzato founded CERIZ bicycles in 1921 (the abbreviation CRP can also be found on CERIZ bikes) and bought Atala in 1938 (Source: Moore R, Benson D. Bike! A tribute to the world's greatest cycling designers. London: Aurum; 2012.). I have a hard time imagining that Atala made its own tubing. Somehow I think they simply rebadged Columbus Aelle, which was marketed as "Tubi speciali in acciaio al carbonio manganese". The CRP SM-08 sticker reads almost the same: "Tubi speciali in acciaio al carbonio microlegati". More than just coincidence, I think. And finally, why was Atala’s house-label steel tubing named 'Tullio' and why was ‘Tullio’ later replaced by “CRP” (Cesare Rizzato Padova) tubing? “Atala bicycles are made by C. Rizzato & Co. in Padova, Italy. Cesare Rizzato is now in his seventies but is still a very active man, riding a bicycle … 12 miles to and from work each day, and periodically travelling abroad – for example, recently to Guatemala and New York – to look after his company’s business affairs. He was a boyhood friend of Tullio Campagnolo, an association which no doubt has been an influential one during the half-century Rizzato has been making bicycles. 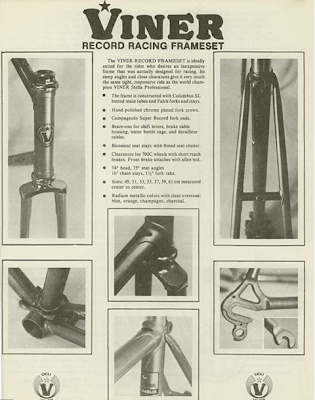 (‘Tullio’ steel tubing is used in the frame of the Grand Prix II we tested, for instance.) Rizzato is the largest bicycle manufacturer in Italy, and the only one offering a complete line of bicycles …"
‘Tullio’ steel tubing was replaced by ‘CRP’ in the very late 1980s. Perhaps the folks at Campagnolo had complained that Atala had ‘stolen’ their brand name, or Atala wanted to honor their (by now deceased?) chairman. At any rate, Tullio had died in 1983, and although I could not find any biographical dates for Cesare Rizzato, we know that he was born around 1901 (like Tullio Campagnolo), so by the time 'CRP' was introduced, he would've been almost 90. The most likely scenario is that both men were dead and that relations between Campagnolo and Atala had soured so Atala could not continue to use 'Tullio' as their house label. sak_art design writes in about their design work for the Parkpre FUTURE frameset. The FUTURE is available as a limited series in various national colors, and a World Championship edition. sak_art design is based near Pisa, with a focus on industrial and motorcycle design; their planning programme includes research product planning, concept design and modelmaking to offer tangible product models. At the Sidi Sport headquarters yesterday, in Maser (Treviso), Dino Signori and the entire Sidi staff embraced the number one rider in the 2013 World Tour classification, Joaquim Rodriguez. To celebrate their champion Sidi had a cake made with a decoration worthy of the world's top rider...in fact, the cake was embossed with the image of the Spanish ace's remarkable victory at the Giro di Lombardia, the last in a long line of achievements for Purito Rodriguez, who bounced back from second place at the World Championships in Florence with this fantastic success. 5,000 riders in this year's edition, held October 13th. I began the Italian Cycling Journal in January, 2007. For the first couple of years it was the mechanism for sharing my personal Italian ride stories. 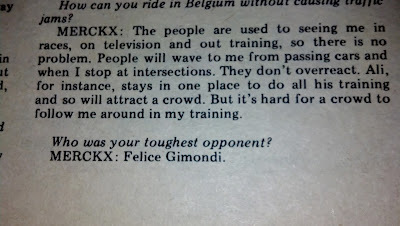 Through the years ICJ morphed into covering many aspects of Italian cycling. Now almost seven years old, the blog already contains more than 3,000 entries. In August, 2011, I enabled a visitor statistics app which indicates there have been very close to 1.2 million visitors, representing 205 countries. At this point I would like the blog to be more reader driven, where YOU are the guest contributor. Just email me at veronaman@gmail.com with a story, a tip (like the one I have yet to publish about a 2014 ride for Passoni owners), etc. The upshot of this change will be that the amount of content will likely change a great deal since it will be dependent upon your contributions. Special thank you to all that have already contributed. 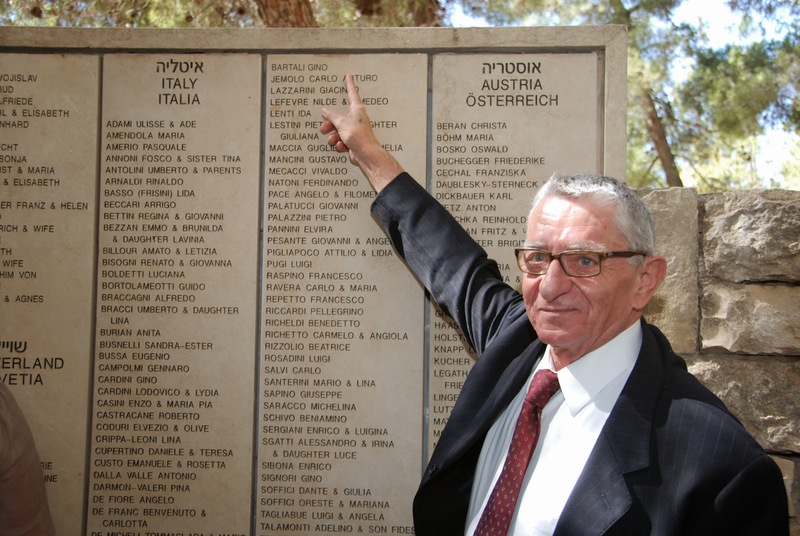 This morning, at Yad Vashem, the Shrine of Remembrance in Jerusalem, Gino Bartali’s name was engraved on the Wall of Honor in the Garden of the Righteous. Also in attendance at today’s ceremony were Dorit Novak, the general director of Yad Vashem, Giulia Donati Baquis and Giorgio Goldenberg, who survived the Holocaust thanks to the false documents provided by Gino Bartali, and Renzo Ventura, representing his family members who also survived thanks to Gino. 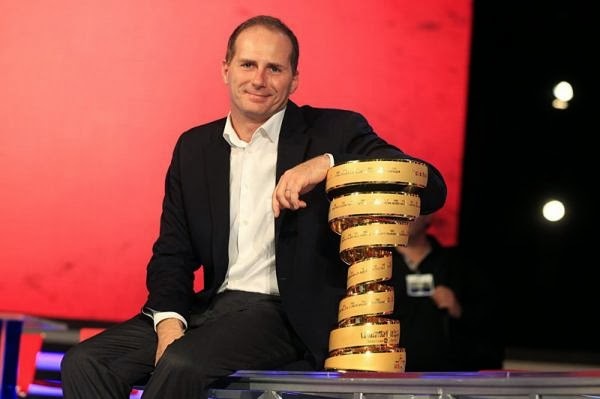 After receiving the honor on behalf of his father today, tomorrow Andrea will be at the start of the first edition of the Gran Fondo Giro d’Italia Jerusalem. The amateur cycling event, which will see hundreds of Giro d’Italia fans on the streets of Jerusalem, is part of the Gran Fondo Giro d’Italia series; two rounds remain: Beverly Hills on November 3 and Miami on November 10. The 2014 Giro d'Italia will also mark the centenary of Gino Bartali's birth. The Dubai Tour, a four stage race from 5 to 8 February, 2014, was established by an agreement between Dubai Sports Council and RCS Sport back in May of this year. The Dubai Tour will now open the Asia Tour calendar. 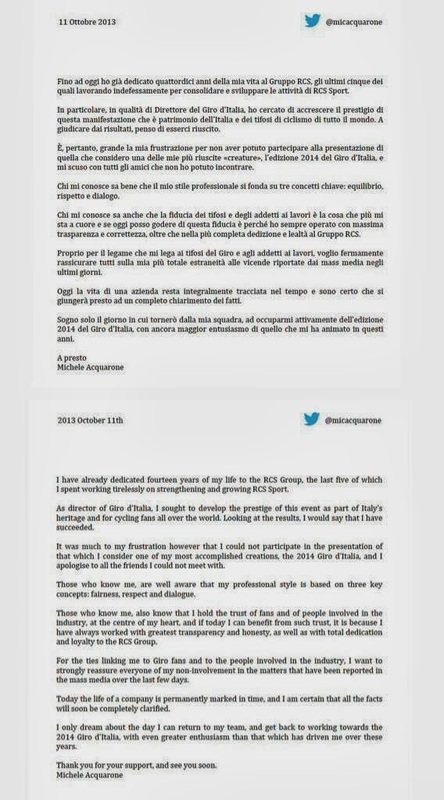 That agreement, coupled with the exemption obtained from the UCI rules to allow a rest day during the first week in this next year's Giro d'Italia (the first three days will be in Ireland, followed by a rest day, before the race resumes in Italy), opened the door to consider a start in Dubai. "It's something we're working on and which will be discussed as part of our strategy," said a UAE official. "Next year we're going to see the stages in Ireland and see how they do. Then, we'll open the negotiations with RCS Sport and the Giro to accommodate one or two stages in Dubai." As a result of the UCI exemption the 2014 Giro will be the first foreign start for any Grand Tour since the implementation of a new UCI regulation prohibiting rest days on three-week Tours until the completion of at least seven days of racing. 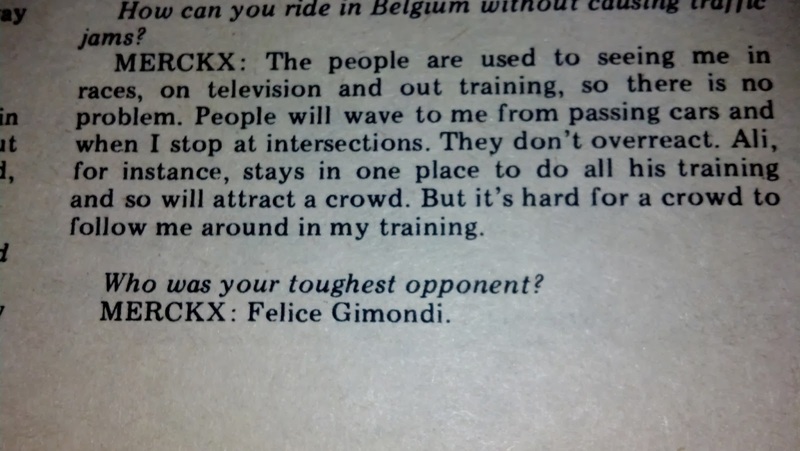 When that rule was implemented RCS Sport stated that because of it was highly unlikely that the Giro could ever start in the USA. José Joaquín Rodríguez won his second Il Lombardia in as many years this afternoon, thanks to a brilliant solo attack on the Villa Vergano climb. It was a carbon copy of his 2012 win, also in the rain, and brought the Spaniard both revenge for last week’s second place in the World Championships, and provisional World Number One status, with just one more World Tour race left in the 2013 calendar. Alejandro Valverde was second, and Rafal Majka third. Muro di Sormano climb: (fastest time for Muro di Sormano): Dario Cataldo (Sky) in 9’32” average 11,328 km/h. Premio Vincenzo Torriani (first rider to complete the Muro di Sormano): Nairo Quintana (Movistar). Premio Pierluigi Todisco (the first rider to cross the Ghisallo): Thomas Voeckler (Europcar). 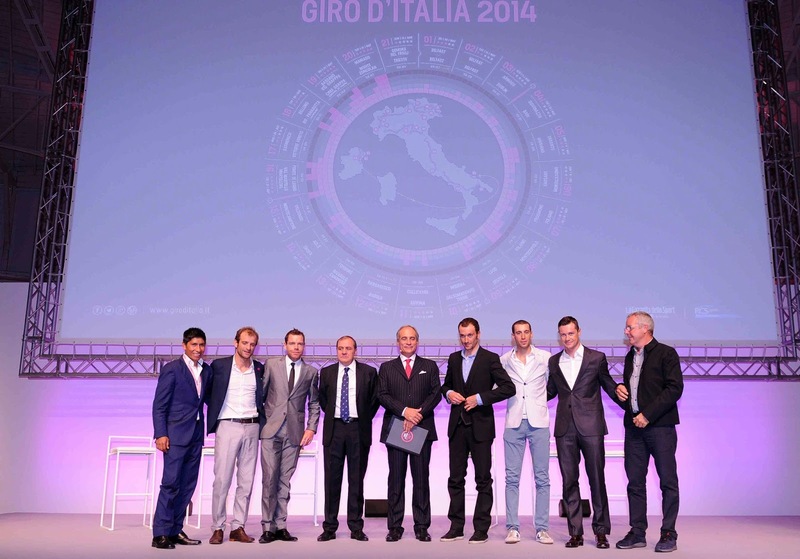 The unveiling of the 97th Giro d’Italia took place this afternoon at the Ice Palace in central Milan. 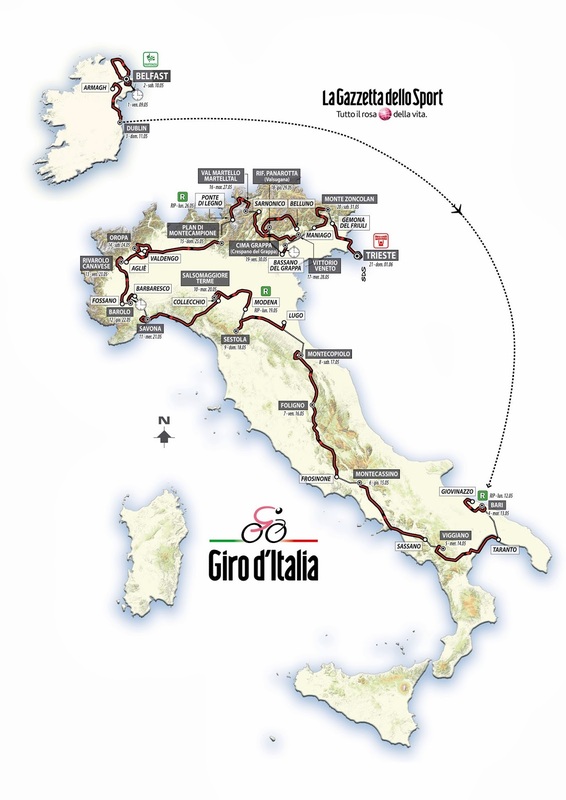 With no less than nine uphill finishes spread over a 3,449.9 kilometre itinerary which starts in Belfast on Friday 9 May 2014 and finishes in Trieste on Sunday 1 June 2014, the 2014 Giro d’Italia promises to be a race for climbers. After two opening stages starting and finishing in the capital of Northern Ireland, the peloton departs Armagh for a symbolic border crossing into the Irish Republic en route to the stage finish in Dublin. After three historic stages in Ireland, a vast air bridge will transfer the riders, race staff and event infrastructure to Italy’s South East, where the race recommences with stage four, from Giovinazzo to Bari. 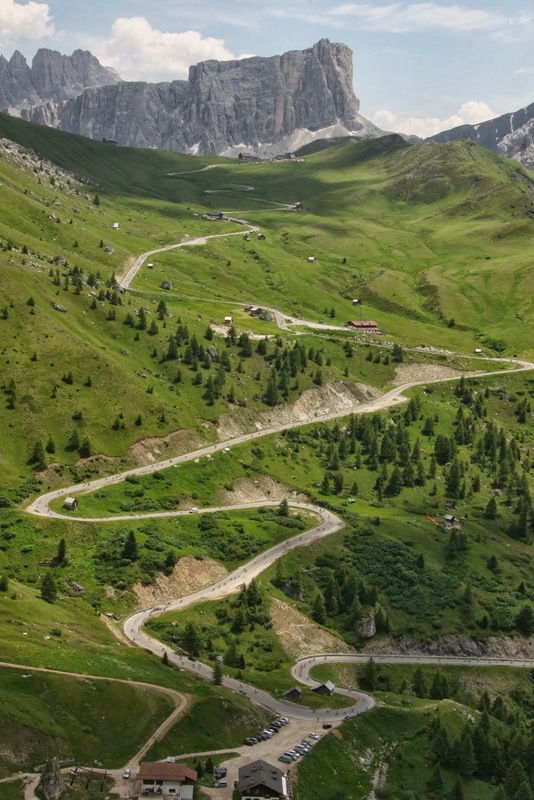 The route then arcs clockwise across Italy, through the Apennines, to the North West of the peninsula, before heading eastwards to take on the monumental climbs of the Italian Alps and Dolomites. The itinerary of mountains reads like a roll call of classic Italian climbs, including Oropa, Montecampione, Val Martello/Martelltal (via the Passo dello Stelvio – this year’s Cima Coppi, the highest point of the race itinerary; on 16th stage), Monte Grappa and Monte Zoncolan. Lesser-known climbs like Sestola, Montecopiolo and the Rifugio Panarotta in Valsugana, and the short, steep ramps that lead up to Viggiano and Montecassino, hold the potential for more, spectacular racing. Six flat finishes will entice the sprinters, and a further four transitional stages – including stage 11, with a technical, 21km-descent from the intriguingly-named Naso di Gatto or Cat’s Nose, down into the town of Savona – complete the race itinerary. 94.9km of the 2014 Giro are dedicated to time trials. Hostilities open on Friday 9 May with a 21.7km team time trial around Belfast. At the midpoint of the race, the long individual time trial from Barbaresco to Barolo (stage 12, 46.4km) includes a categorised climb in the final 10 kilometres. Then, on the last stage but three, a grueling, 26.8km mountain time trial takes in the 19.3km climb up to Cima Grappa (Bassano del Grappa – Cima Grappa/Crespano del Grappa). After the final, grueling mountain finish atop the forbidding Monte Zoncolan, the peloton will race into the stunning city of Trieste, where the 97th Giro d’Italia will draw to its dramatic close. 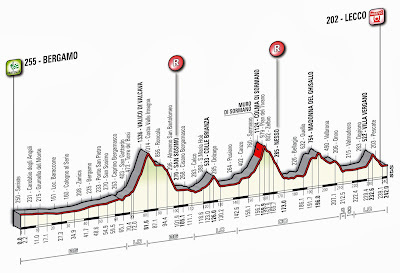 Tomorrow morning at 10.50, the 107th edition of Il Lombardia departs Largo Porta Nuova, Bergamo, Italy. The ‘Race of the Falling Leaves,’ organized by RCS Sport/La Gazzetta dello Sport, will see the world’s finest on the startline. Among them, the new World Champion, Rui Costa, determined to start his year-long reign with a victory. 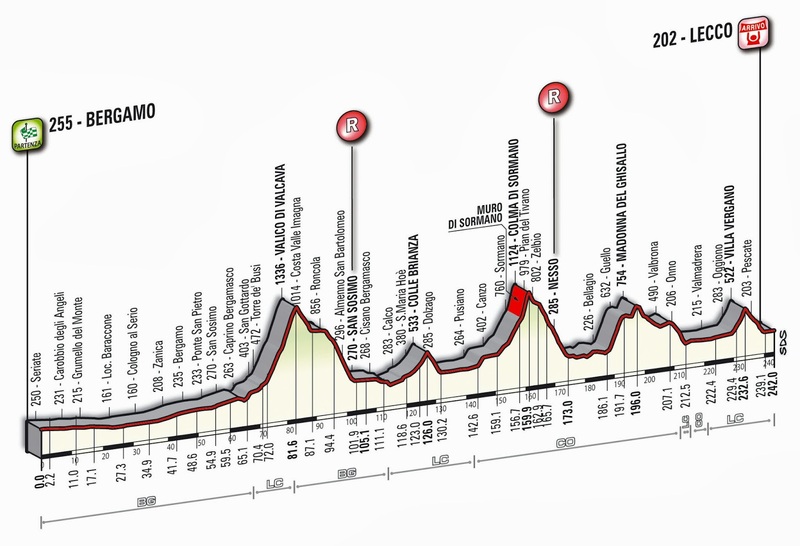 The race route, 242km from Bergamo to Lecco, comprises five major climbs: Valico di Valcava, Colle Brianza, Colma di Sormano (with the Muro di Sormano), Madonna del Ghisallo, and Villa Vergano. In common with other Italian sports events this weekend, one minute of silence will be observed prior to the race start, in memory of those lost at sea two days ago off Isola dei Conigli, near Lampedusa. 25 teams start the race, 18 World Tour and 7 wild cards. Teams are of 8 riders. Il Lombardia 2013 will be the first race in the Rainbow Jersey for the new World champion, Rui Costa. 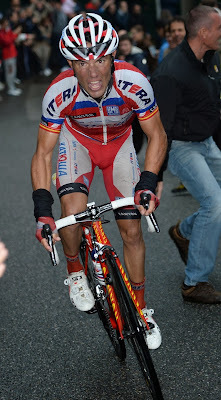 The last to win the Race of the Falling Leaves wearing the Rainbow Jersey was Paolo Bettini in 2006. The winners of no less than seven past editions of Il Lombardia start tomorrow. They are: Damiano Cunego (2004, 2007 and 2008), Philippe Gilbert (2009, 2010), Oliver Zaugg (2011), and reigning champion José Joaquín Rodríguez. The winner of the Giro d’Italia, Vincenzo Nibali, also takes the start, as does runner-up Rigoberto Urán, third here last year. Multiple grand tour winner Alberto Contador also rides. Movistar appears to be the team to beat: as well as the new World Champion, Costa, they field Tour de France runner-up Nairo Quintana, Vuelta a España and World Championships podium finisher Alejandro Valverde, and Beñat Intxausti, stage winner and over-night Maglia Rosa during the 2013 Giro d’Italia. First held in 1905, Il Lombardia (formerly the Giro di Lombardia) is the classic which has suffered fewest interruptions: only the 1943 and 1944 editions were suspended, because of the second World War. Fausto Coppi won a record five editions of Il Lombardia, four of them consecutive: 1946, 1947, 1948, 1949 and 1954. The record for podium finishes is held by Coppi’s great rival, Gino Bartali, with 9: 3 wins, 4 seconds places and 2 thirds. The only non-Italian riders to have won the race three times were Frenchman Henri Pélissier and Irishman Sean Kelly. 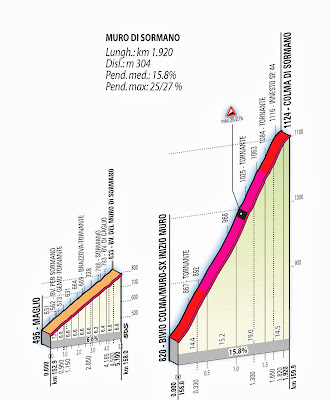 The climb up the Muro di Sormano will be timed. Results will be published after the race finish. La Gazzetta dello Sport will award two special prizes. The first rider who reaches the Muro di Sormano will be presented with a plaque dedicated to Vincenzo Torriani, the former and long-time director of the Gazzetta races. 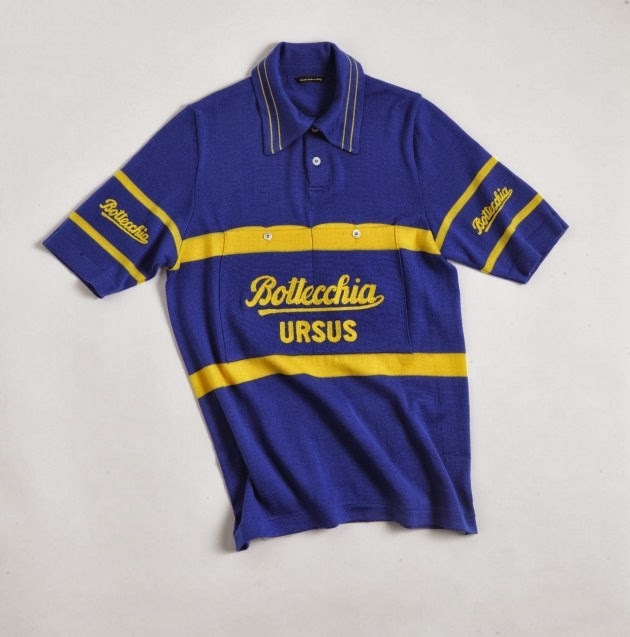 Torriani first planned the climb up to Colma di Sormano in 1960: Il Lombardia used the road in 1960, 1961 and 1962. The severe gradient (touching 27%), the slope was dubbed ‘il muro’ (the wall). The Premio Pierluigi Todisco goes to the first rider to cross the Ghisallo. The prize commemorates the Gazzetta journalist Pierluigi Todisco, who was killed in a road traffic accident while cycling to the newspaper’s offices two years ago. It is the second time the award will be presented. In Italy the race will be shown live on Rai Sport 2 and Rai Tre. The race will be streamed live on the website www.raisport.it. Real-time news and analysis are provided on www.gazzetta.it. Il Lombardia will be televised in 156 nations. As well as two hours of live coverage on Eurosport (80 nations in Europe, Asia and the Pacific area), Il Lombardia will be shown in Belgium by the Flemish channel VRT, in the Netherlands by NOS, Switzerland by SRG SSR, and Spain by the FORTE circuit (comprising EITB Euskal Irrati Telebista in Euskadi, TV3 Televisió de Catalunya in Catalonia, TVG Televisión in Galicia, and Televisión del Principado de Asturias (TPA) in Asturias). In the United Kingdom, Sky Sports will show prime-time evening highlights. The channel beIN Sport holds exclusive broadcast rights for France and the United States of America. In the Middle East, Il Lombardia is shown by Al Jazeera. In Canada, English-language coverage is by Sportsnet, and French-language coverage by Réseau des Sports (RDS). In Mexico, Panama, Guatemala, the Dominican Republic, Costa Rica and El Salvador, Il Lombardia will be covered by Televisa Deportes Network (TDN). Il Lombardia will be broadcast in Asia by Eurosport Asia Pacific. The other national broadcasters in the Asian area are: J Sports (Japan), Sony TV Six (India, Sri Lanka, Pakistan, the Maldives, Nepal, Bangladesh, Bhutan and Afghanistan) and True Visions (Thailand). In Kazakhstan, Khabar TV broadcasts the Giro d’Italia. 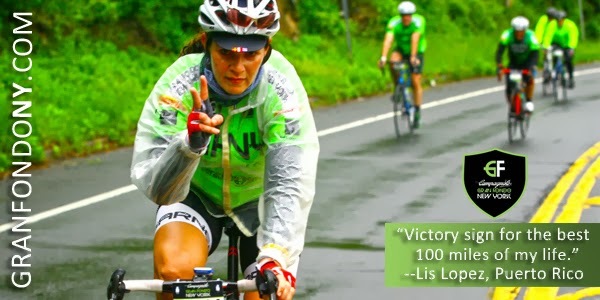 In Australia SBS confirms the great national enthusiasm for cycling by showing the race live. 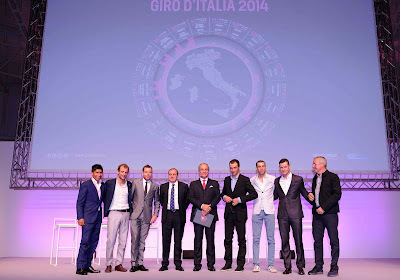 Giro d'Italia 2014 presentation: 7th October! Live streaming on http://www.giroditalia.it and http://www.gazzetta.it from 2.50 pm CET (Central European Time)! 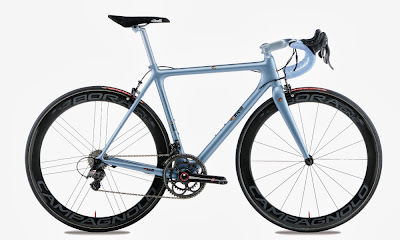 The Cinelli Laser, the full carbon version, is now available as the "Laser Mia". The Laser, Cinelli icon, thanks to the work of the Laser Team is now a carbon jewel. 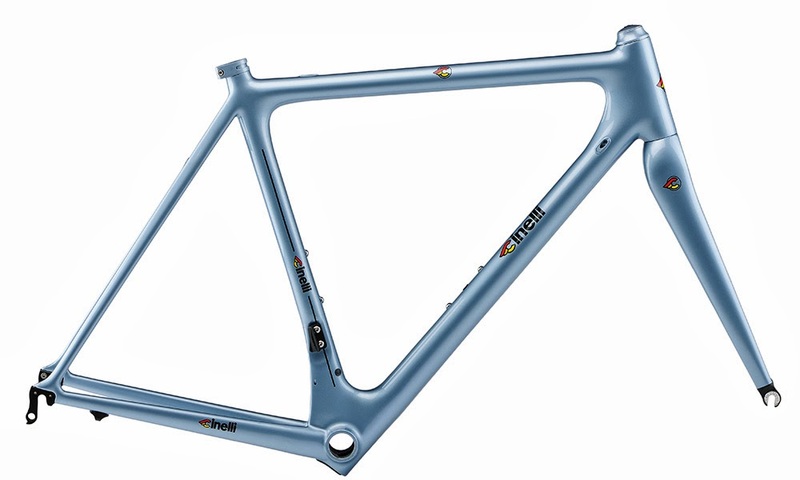 All Made in Italy through a sophisticated wrapping technique of the carbon elements that are further processed, it is possible to build a custom frame of only 890g. All the elements identifying the Laser are maintained: the fin under the bottom bracket, the fittings of the joints and the passage of the rear wheel housed in the seat tube. The cable routing is fully internal for both mechanical and electronic groups. 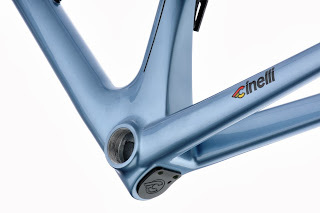 The rear aluminum CNC dropouts sandwich wrap the central carbon part fully integrated to the rear stays. A proper anodized aluminum cap positioned under the fin of the bottom bracket allows easy access for routing the shift cables. 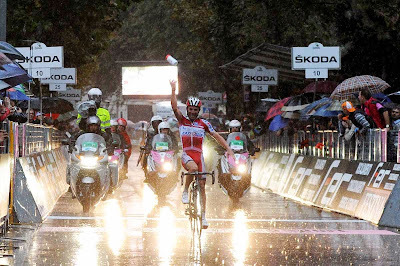 Exactly a week after the Road World Championships in Florence, won by the Portuguese rider Rui Costa over Spain's Joaquin Rodriguez, a riveting revenge is expected on the road of the 107th edition of Il Lombardia; Rodriquez won last year's Il Lombardia. The “falling leaves classic”, organised by RCS Sport/La Gazzetta dello Sport, on Sunday 6th October will have the champions of racing pitted against each other. The 242km route from Bergamo to Lecco, will climb the slopes of Valico di Valcava, Colle Brianza, Colma di Sormano (with the mighty Muro di Sormano), Madonna del Ghisallo and Villa Vergano. It’s going to be highly dramatic and hardly fought. 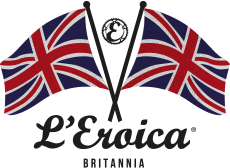 Amongst the provisional starting list, and alongside the last edition’s winner, Joaquin Rodriguez, there are the following big names: the newly crowned World Champion, Portugal’s Rui Costa, Italians Vincenzo Nibali, Ivan Basso, Franco Pellizotti, Damiano Cunego, Michele Scarponi, and Diego Ulissi; British rider Chris Froome; American Tejay Van Garderen; Australian Cadel Evans; the Colombians Carlos Betancur, Rigoberto Uran Uran, and Nairo Quintana; Spanish Alberto Contador, Alejandro Valverde; France’s Thibaut Pinot and Thomas Voeckler; Holland’s Bauke Mollema and Robert Gesink; Belgium’s Philippe Gilbert and Greg Van Avermaet; Ireland’s Daniel Martin; Slovakia’s Peter Sagan, and Poland’s rider Michal Kwiatkowski. 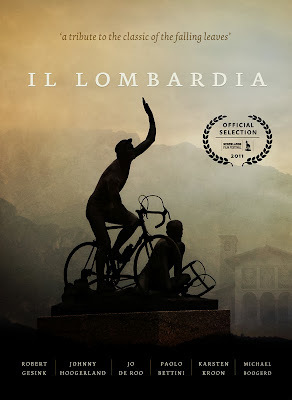 Begun in 1905, Il Lombardia (previously known as Giro di Lombardia) has taken part every year except for 1943 and 1944 due to the Second World War. Fausto Coppi has won the largest number of Il Lombardia titles with five in total: 1946, 1947, 1948, 1949 and 1954. 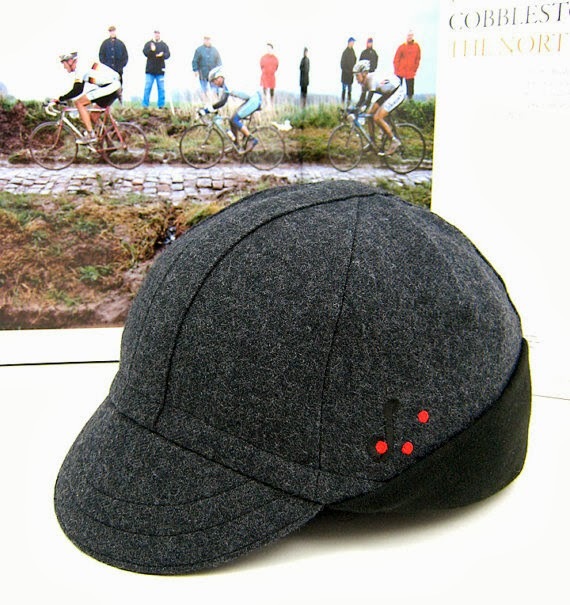 The man behind Cycling Art Blog also makes beautiful cycling caps under his Red Dots Cycling brand. 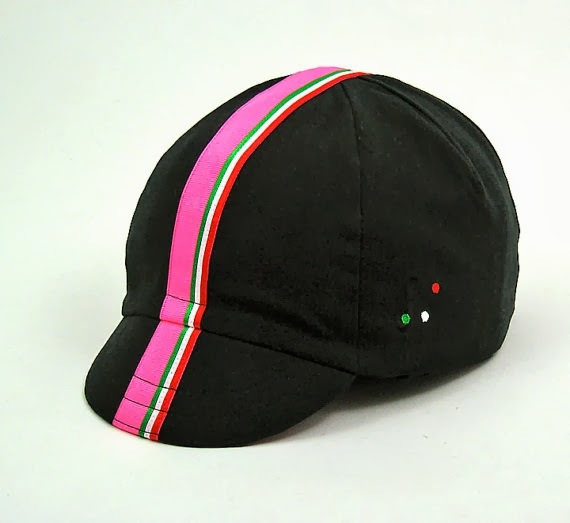 In the current inventory is this black linen/cotton, pink cotton twill under brim cap with a pink stripe and Italian tricolore ribbon detail. Visit Red Dots Cycling to see all the different models. Chris Froome, winner of the 2013 Tour de France, dropped in for a visit at the Sidi Sport headquarters in Maser (Treviso). Following Sunday's difficult and busy day riding with the British national team at the World Championships in Florence, he took advantage of his jaunt in Italy to pay a visit to Dino Signori, the man who has been "shoeing" the British champion since 2010. Froome uses the Sidi Wire shoes the top models in the Sidi Sport collection, which were in yellow this year in a special edition for the champion from Team Sky to wear during the conclusive showcase in Paris. "This is my first visit to Sidi, it really meant a lot to me to meet Dino Signori in person, he's a man with extraordinary charisma," says Chris Froome. “I like Sidi shoes not only for their appealing design; I also benefit from a technical standpoint because they join lightweight qualities to sturdiness, two fundamental aspects for obtaining maximum performance, even in the most difficult race situations. I really appreciated the yellow Sidi Wires that Sidi made especially for me for the final showcase on the Champs Elysées. Now they hold a special place in my memories because they were one of the elements that contributed to this success. The victory in the Tour was extraordinary, but it hasn't changed my life, I'm the same guy I've always been for my friends, family and team mates. In the morning I get up and go out to train on my bike, this is my priority. Of course now there are many more commitments and when I go to the supermarket to do the grocery shopping it's nice to run in to people who recognize you and stop you for a picture and an autograph, this had never happened to me before. Certainly I have more responsibility on the team and I know I'm an example even for the younger riders who are new to cycling, but I'm not afraid of this; on the contrary, it's a source of pride. 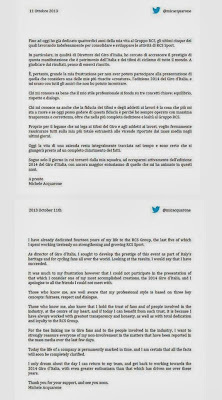 The Giro di Lombardia (this Sunday, October 6th) will be my last race of the season, then I'm going to take a holiday in Kenya and after that I'll start thinking about 2014, when my main objective will once again be the Tour de France."